Our ‘Laos 4000 Islands, Elephants, Wild Coffee and Waterfalls’ tour is crafted to get the most out of the delightful 4000 islands, Bolaven Plateau and Loas, beautiful wild south. Perfect for those of you who love elephants and want to get off the beaten track. This more rustic tour is then topped off by a trip to the fabulous temple of Wat Phou. This 8 day cram packed adventure is a fantastic way to see the magnificent south. 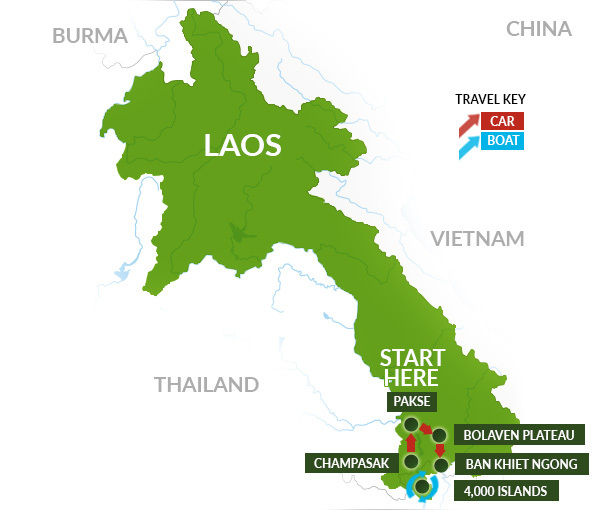 From our starting point of Pakse to the Bolaven Plateau, every day is a new adventure. Stopping at villages, waterfalls and a coffee plantation to keep the energy levels up. Along the way you have a couple of opportunities to get acquainted with elephants from watching them bathe to a jungle trek at Ban Khiet Ngong. There is also time to relax in the surroundings of the 4000 islands and the island of Khone. Take time to soak up the scattered French colonial buildings by cycling around some of the islands as well as cooling off in some of the rock pools. We also recommend for your free day to venture to Don Daeng Island too. This tour is a fantastic way to experience the Laos elephants, as well as having the added bonus of seeing the rare Irrawaddy dolphin too, if you’re lucky! We’re sure that you will agree that this tour gives you the very best snapshot of the south. Upon arrival at the airport in Pakse you will be met by a ‘See Asia Differently’ representative and transferred to the Bolaven Plateau, known for its cooler temperatures being located high above the Mekong Valley. Along the way you stop at Houey Ten village, that specializes in knife making, a tea plantation and the picturesque Tad Fan Waterfall. After pausing at a coffee plantation and the Tadlo Waterfall you arrive at Bolaven Plateau. Today you are able to explore the picturesque plateau under your own steam. Relax and take a walk through the region’s villages. Alternatively, depending on your first day’s flight arrival, you will then visit some of the attractions missed. After breakfast you will leave the plateau and head to Ban Khiet Ngong. Along the way you will stop at the magnificent Paxuam Waterfall before continuing to Kingfisher Eco Lodge, arriving in time for a leisurely lunch. You then have the remainder of the day to unwind, enjoy the beautiful wetland surroundings and watch the wildlife come and drink at the watering hole in front of your hotel. Today you will experience a full day’s fabulous elephant adventure. You will venture through paddy fields and wetlands before stopping for a picnic lunch and letting the elephants scavenge for food. After a wonderful day with your new companions you then return back to the lodge in time for sunset drinks on the sundeck. Today you will travel south to the waterside village of Ban Hatsaikhone, where you will board a local private boat to take a magical boat tour of the beautiful 4000 Islands. You will reach the picturesque island of Don Khone by lunchtime, and in the afternoon you can explore the island by bicycle. It is also possible to take another boat out on the Mekong in search of freshwater dolphins before settling in for the night. This morning you will leave the island by boat and then take a short drive to the spectacular Khone Phapheng Falls, one of the largest and most powerful waterfalls in Southeast Asia. From here you will continue to the quaint town of Champasak, where you will settle into a lovely hotel that rests on the river banks of the Mighty Mekong. Today you will take a morning trip to see the incredible temple of Wat Phou, which is a true highlight of any trip to Laos. After time discovering the majestic hill site temple you return to your hotel. You then have the afternoon free to relax as you wish. We recommend taking a boat across to Don Daeng Island to have lunch and then explore the peaceful island by bike. Depending on the time of our flight you may have the morning to relax in Champasak before we transfer you to Pakse to catch your flight home.